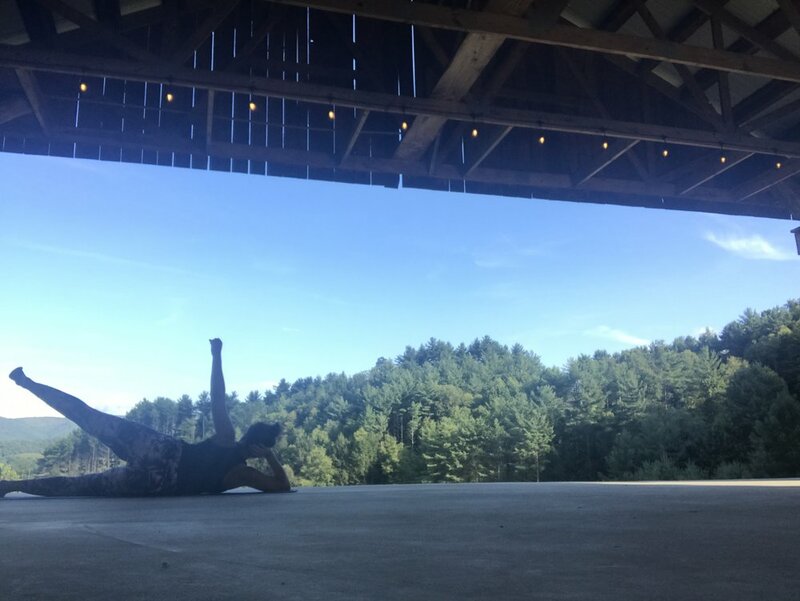 Believe it or not, we're a little more than half-way thru our Namaslay® 200hr Yoga Teacher Training in the beautiful mountains of Tennessee. I've been amazed at how far our students have come in just this short amount of time. They've been able to digest the huge amounts of information and instruction that comes along with a 200hr intense teacher training, and it's so exciting to watch them start to grow in confidence and knowledge and be that much closer to becoming certified yoga instructors. This training is not without it's challenges as well though. It's rigorous both physically and mentally and being away from friends and family for so long can be more difficult than imagined. That said, let's check in with our trainees to see how they're feeling this much closer to the end. Be sure to comment below if you have any questions you're curious to ask about their experience thus far. 1. What are you missing most from home and what strategy are you using to help? I miss my friends and family the most but keeping in touch through phone calls/facetime/social media helps a lot. We also send a lot of pictures back and forth which is a fun way to see what they're up to. 2. What has surprised you most about YBC® YTT? I knew the training would be intense so the crazy schedule/curriculum hasn't come as much of a surprise but Ive been pleasantly surprised by how well we have bonded as a group and THE FOOD. I was so scared the food options would be boring and repetitive or limited but our chef is SO amazing and creative. Every meal is so fresh and delightful. 2. What do you think has been the most informative aspect of this training? This can be absolutely anything. I think Ive definitely learned the most from the anatomy classes. Coming into this training I didn't know much at all so although its been challenging I've really learned so much about the body and how it works and moves. Even though its overwhelming at times I know it's going to help me loads as a yoga teacher. 3. What has been your favorite aspect of the training so far? It can be anything - from food to anatomy lesson. Hands down getting to know all of these amazing women, we have so much fun together, share so many laughs, but also connect on a deeper level. The love and support I feel in our group is so comforting during such a challenging training. I've also loved getting the chance to deepen my own practice, build strength, and master new poses. SO empowering!!! Definitely missing my dog the most! Buckles has been great at comforting me and keeping me sane on the days I need my dog the most. I think I have been surprised by the wide variety of knowledge we have been taught. So many things have been incorporated into this training and it was been extremely well thought out! 3. Did you spend any time worrying or analyzing something before arriving, that now that you're here, doesn't seem to matter? I worried about not being able to keep up but I think now being here, we are all on the same page. No matter how much I prepared I don’t think i would have been able to get through this without getting worn out or stiff. My boyfriend, my bed, and a better sleep schedule. My best strategy is to ride the emotional wave that is YTT. I have cried almost every day but two so far and today is day 11. I’m surprised that the training is as emotionally demanding as it is physically demanding. I expected to be tired and worn out from all of the practices and training, but I didn’t expect to be so emotionally spent. 3. What do you think has been the most informative aspect of this training? This can be absolutely anything. I think that the anatomy has been the most informative - however informative doesn’t mean easy. 4. What has been your favorite aspect of the training so far? It can be anything - from food to anatomy lesson. Even though it’s super hard lately - the 5:30 AM meditation, pranayama, and yoga followed by breakfast with our “breakfast groups” is definitely my favorite aspect of the training. I grew really close to both women in my breakfast group so knowing that I have them with me to start the day has been so helpful. I am missing my wife and my fur babies! I have to keep reminding myself that I need to fully experience this intensive YTT and Home is not too far away. This experience has been absolutely amazing and I love being surrounded with people who share the same passion: yoga. It is such a lovely feeling to finally find your tribe and be supported so strongly by amazing women. The food!! Most of the food we’ve been eating is literally straight from the garden. Simple and homemade meals after a long day truly warms the tired soul. 4. What's your overall impression of Namaslay® YTT so far? I am so thankful and #blessed to be here and be going through so much more than a YTT. Waking up to experience, share, and live my passion everyday is indescribable. 1. What has surprised you most about YBC® YTT? The curriculum is way more in depth than I imagined. I assumed we would learn about the poses and how to create a class, but it is so much more than that. It makes me feel more confident about leaving here ready to jump into teaching. As hard as the anatomy classes have been for me, I’m finding it very useful to understand how the body moves. It has made me think about poses and sequencing from a completely new angle, even in my self practice. I’ve really enjoyed having such a variety of teachers. They all bring something different to the table whether it is their personal style, the way they teach or there areas of focus. 4. Did you spend any time worrying or analyzing something before arriving, that now that you're here, doesn't seem to matter? I was worried I wouldn’t be in good enough shape. I was doing yoga frequently but wasn’t doing as much strength training as I had wanted. Once we got going with the training I didn’t feel as worried about it. I just did my best and pushed myself as much as my body would allow. My husband and three kids. Between the intense training schedule and their crazy schedule back home, I haven’t been able to talk to them too much. I have been sending them funny Snapchat videos every morning. My husband says my three year old daughter asks to watch them over and over. 2. Do you wish you spent more time preparing for anything? I was honestly worried about the other trainees. That was pointless. They are so great. I feel like we are creating a really strong lasting bond with each other. It’s intense. It’s emotionally and physically taxing but it’s very in depth and well rounded. The teachers are wells of knowledge and I’m confident in my decision to come here! My boyfriend/family. I love to travel, but I get homesick easily. I try to call home at least every other day and use messaging apps to keep in touch when I have spare moments. How much I've learned that is relevant to my life as a whole, and not just yoga! Whatever happens or whatever I do after the training, I'm leaving with so many life lessons and tools. I feel like this changes daily... but I think the most awesome thing so far was getting into Eka Pada Galavasana variation (Baby flying pigeon pose) for the first time! We're stronger than we tend to believe. 4. Do you wish you spent more time preparing for anything? I wish I had spent more time on learning the Sanskrit names for poses and had practiced teaching either to a camera or a friend ahead of time. You jump RIGHT into everything, so it's good to have an open mind and be ready to rock n roll. 1. What do you think has been the most informative aspect of this training? This can be absolutely anything. Learning how to sequence the flow in a yoga class. I've always had trouble doing unguided practices alone in my home because I wasn't able to find a cohesive flow on my own. We've talked a lot about how to sequence flows so that they make sense and work well for the body, as well as practicing writing and teaching our own flows. This understanding will obviously be very helpful as a yoga teacher, but also gives me a lot more freedom in my own personal practice. 2. What has been your favorite aspect of the training so far? It can be anything - from food to anatomy lesson. Buckles! Dogs are my favorite thing in the whole world, and nothing makes the stress of anatomy and yogic philosophy melt away like hugging a dog. Especially one as fluffy as Bucky!! I definitely worried too much about the strength training portion. I was so scared I wouldn't be strong enough to keep up, but the trainers here do a great job of gearing and modifying the strength trainings so that everyone can participate at their own level. I absolutely love it! The training is so comprehensive and covers literally every topic you could think of. Any questions you have, one of the teachers here knows exactly how to answer it, and we get unending support; both from the teachers and from the other trainees. It's basically like having a yoga family. It's great! How much physically stronger I am now - thanks teachers!